Grandmoms - Don't know what to do with your gown but don't want to get rid of it? 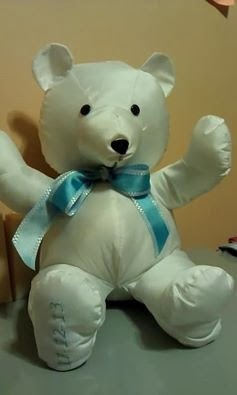 How about having a teddy bear created with baby's birthdate machine embroidered on the bottom of it's foot for your grandchild? Pink or blue ribbons can be added. If your gown has embellishments you'd like to also add, we can put a vest or skirt on the bear too. Prices vary depending on what you'd like your teddy bear to look like. Here's a sample of a basic teddy bear.